47 years, 9 months, 19 days old age. 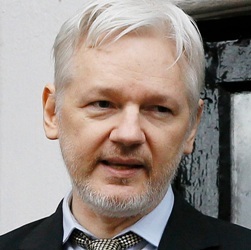 Julian Assange will turn 48 on 03 July, 2019. Only 2 months, 10 days, 23 hours, 28 minutes has left for his next birthday. Julian Assange has celebrated the total number of 47 birthdays till date. See the analysis by days count and bar graph. Julian Assange was born on 03-07-1971 in Townsville in the state of Queensland, Australia. He is an Australian-Ecuadorian Computer Programmer, Journalist, Writer, Editor, Memoirist, Activist, Politician, Author & Founder of WikiLeaks. Julian Assange had an unusual childhood. His biological father had separated from his mother even before he was born and he was raised by his mother and step-father. He travelled a lot as a child and had lived at over 30 different locations by the time he was a teenager. He became fascinated with computers as a teenager and discovered that he had an uncanny ability to hack and break into computer systems. Bright and intelligent, he enrolled at the University of Melbourne to study mathematics but dropped out without completing his degree. Eventually, he went on to pursue a career as a computer programmer and software developer and began working on the website WikiLeaks which publishes secret information and news leaks. He began hacking under the name Mendax in 1987. Along with two of his friends, he formed an ethical hacking group. During this time he hacked into several U.S. Department of Defense facilities, the U.S. Navy, NASA, and Australia's Overseas Telecommunications Commission. He also hacked the websites of several prominent corporations and institutions like Citibank, Lockheed Martin, Motorola, Panasonic, Xerox, the Australian National University, La Trobe University, and Stanford University. His activities of hacking were first noticed during the decade of the 1990s. He was accounted for 31 counts against him. He though got away with a fine. He spent three years as a researcher working with the academic, Suelette Dreyfus, who was researching on the subversive side of the internet. Their intensive research culminated in the publication of ‘Underground’, a book which was about Australian hackers that became a bestseller in the computing fraternity. He registered the domain leaks.org in 1999 and publicized a patent granted to the National Security Agency in August 1999 for voice-data harvesting technology. In 2006, he began working on WikiLeaks, a website intended to share secret information and news leaks on an international scale. The site was officially launched in 2007. He ran the site from Sweden, leveraging the country’s strong laws protecting a person’s anonymity. Through his site, he published a lot of manning material and thus was being interrogated by various agencies. He took asylum in Ecuador embassy in London and live there from 2012 to 2019 before he was finally arrested by British police in April 2019. He was born to a visual artist Christine Ann Hawkins and John Shipton. Hollywood film actor Richard Brett Assange was his step-father who died on 1st April 2012. He was married to Teresa Deo Assange from 1989 to 1999 and together has a son named Daniel Assange. He was in a relationship with Sarah Harrison from 2009 to 2012. Sarah is a section editor of WikiLeaks. He enrolled at the University of Melbourne to study mathematics but dropped out without completing his degree. His mother and father separated before his birth. He married while he was in his teens. A documentary film titled 'Risk' which premiered at Cannes film festival in 2016 was based on his life.